When manufacturing our bio bases, we use PDO (Propanediol – Vegetable Propylene Glycol) in place of well known PG. 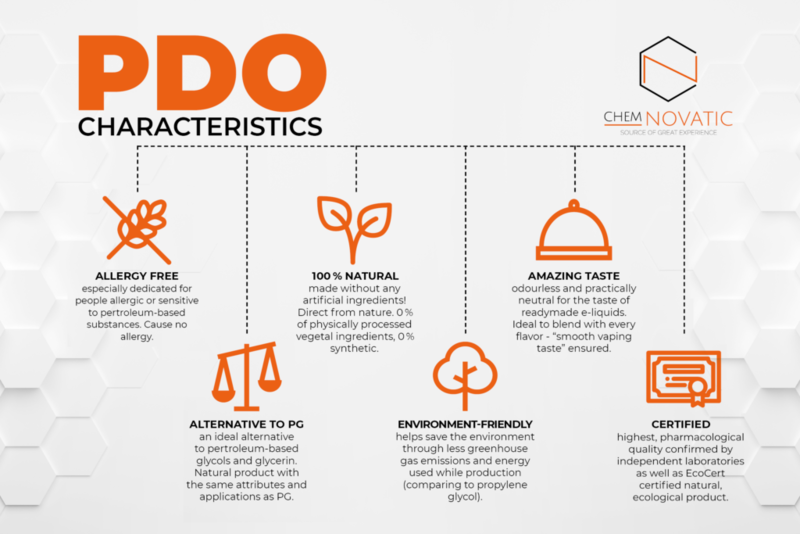 PDO is a natural equivalent of propylene glycol that has been manufactured from vegetable glycerin instead of crude oil. 3. Purification of the product by distillation. Propanediol is GMO-free, renewable, sustainable and reduces carbon footprint by 70% when compared to regular propylene glycol. We have quite a few customers that swear by PDO and have completely removed PG from their shortfills and e-liquids. Another bio base you will find in our nicotine bases range is the VPDO – a 50/50 mixture of PDO and VG. We can manufacture any PDO/VG ratio you wish. As usual, all our bio nicotine bases are 100% tested and certified by independent laboratories. One of the nicotine salts in our product range – Nicotine Malate (NicSalt-M) is a 100% natural vaping product as well. Nicotine naturally occurs in tobacco leaves in the form of nicotine malate – a natural nicotine salt. Nicotine extracted from tobacco leaves takes a freebase form – we all know it from traditional e-liquids. We then add left-handed Malic Acid to freebase nicotine to achieve Nicotine Malate – a completely natural nicotine salt. 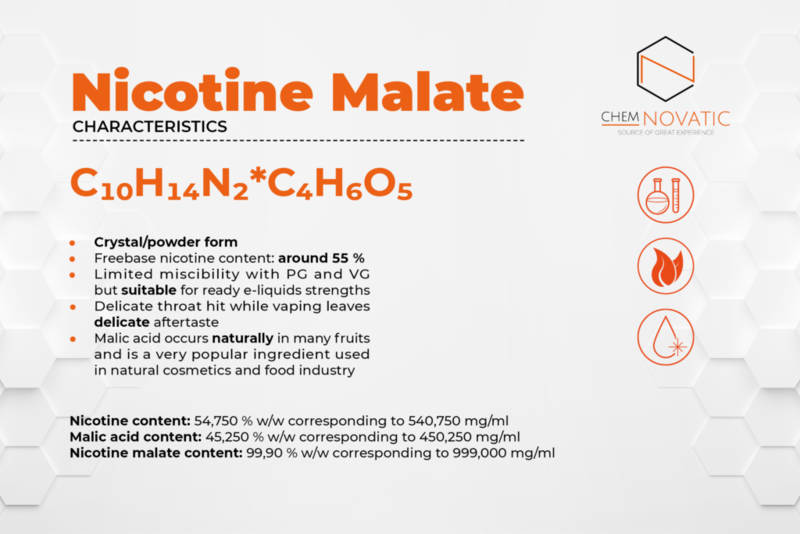 Nicotine malate is used just as any other salt for nicotine salt e-liquids. It dilutes quite well in PG or VG. NicSalt-M gives a delicate throat hit and leaves a pleasant aftertaste during vaping. 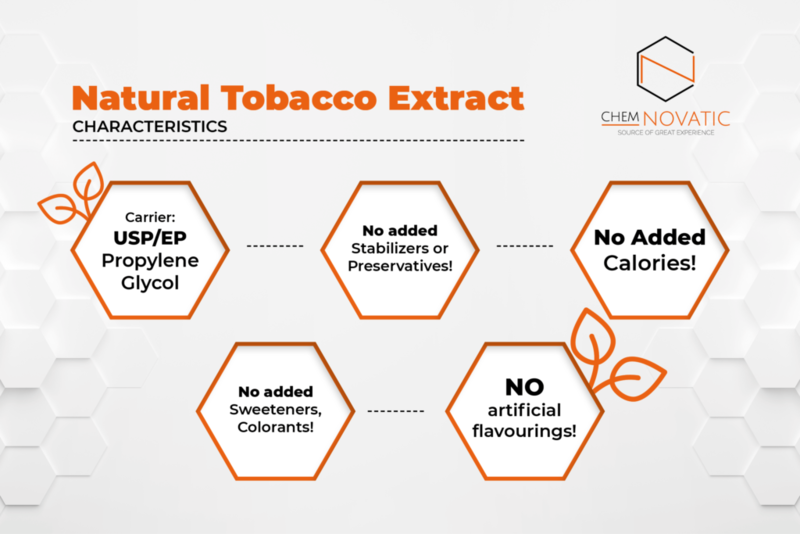 Natural Tobacco Extract is a tobacco flavouring every tobacco enthusiast must try. Created by nature, extracted and steeped by us – you cannot get any more natural than that! Natural Tobacco Extract is achieved via a supercritical extraction directly from tobacco leaves. We use only the most aromatic Virginia tobacco leaves for the best flavour, next we steep the extract to obtain possibly the best, most pure tobacco flavouring available on the market. No artificial flavouring can reproduce the clean, fresh tobacco flavor as well as the real thing! All products are available on Chemnovatic B2B platform – b2b.chemnovatic.com. If you wish to order samples, contact us via email: b2b@chemnovatic.com.